Many people are well aware that bad diet, lack of exercise and being overweight can cause high blood pressure. But there is this major high blood pressure cause, that is hardly mentioned and yet has higher chances than being overweight in causing high blood pressure. Read on to find out more. Lifestyles, such as bad diet and lack of exercise are the most common culprits causing high blood pressure. Being overweight is on the top of that list. But a new study from Europe has found another high blood pressure cause. This one is even more serious than obesity and growing even faster. What Did Scientists Discover about this High Blood Pressure Cause? It’s in your environment, but probably differently than you think. And in one way or another, you’re effected by it every day. The 20th century was marked by a huge relocation of people from rural to urban areas. Building cities with millions and even tens of millions of residents. The air pollution created inside these mass-populated cities is staggering, and as it now turns out, extremely unhealthy. A large team of European scientists decided to study the effects of long-term exposure to air pollution on blood pressure. They first identified 41,072 people who lived in various areas in Germany, Spain, Norway, Sweden, and Denmark. For each area, they calculated its average amount of air and noise pollution. At the beginning of the study, all participants had normal blood pressure. The researchers wanted to know how many would develop high blood pressure during the subsequent five to nine years while living in these areas. Of the 6,207 whose blood pressure increased to high levels during the study, the majority lived in areas with seriously polluted air. 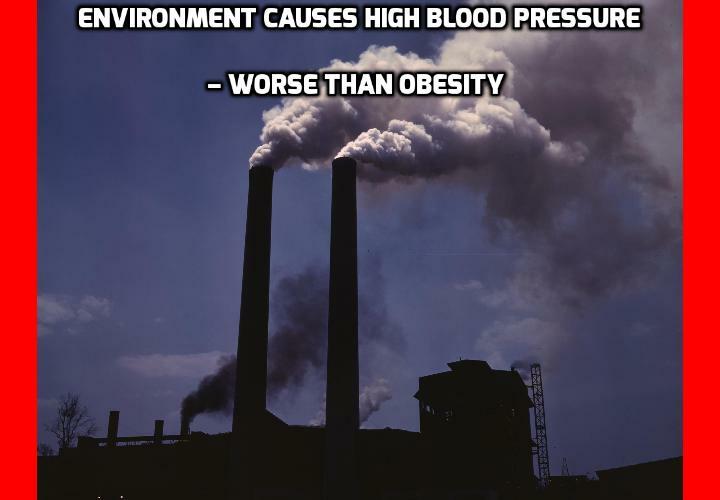 After excluding alcohol use, smoking, and other factors that could influence the results, the scientists concluded that the participants’ risk of developing high blood pressure increased by 22 percent for every five micrograms per cubic meter of particulate matter with a size of less than 2.5 micrometers. To put this a great deal more simply, the more small particles of sulfate, black carbon, mineral dust, ammonia, and other pollutants in the air, the greater the chance that your blood pressure will be too high. What Conclusion Did Scientists Reach about this High Blood Pressure Cause? The risk posed by pollution was even stronger than posed by obesity. Even if you live in a small town or city and are not exposed to the same level of pollution as city people, we can still draw the conclusion that you’re effected, just by the general increase of pollution in the air. But what’s a person to do if you live in a big city and don’t want to move? Or if you have high blood pressure despite living in a cleaner environment?